Adafruit customer service forums • View topic - Is my bootloader faulty? I've trouble getting bootloader mode to work. According to what I've read some leds are supposed to blink when starting in Booltloader mode. When I start I mostly get no leds, sometimes I get all (or almost all) leds. This is less often. x0xbox seems to be working otherwise. USB communication with c0ntr0l seems to work but not firmware upgrade. Since I don't know which OS is on the CPU I'm guessing the only option for me is to buy a new CPU with a modern OS? Or could I initialize it somehow? Re: Is my bootloader faulty? No, the default Bootloader does NOT SET the LED properly. It leaves them in the (more or less) random(!) boot up state. My bootloader changed that. But a new bootloader can only be programmed with a programmer (hardware device), so nobody has that. 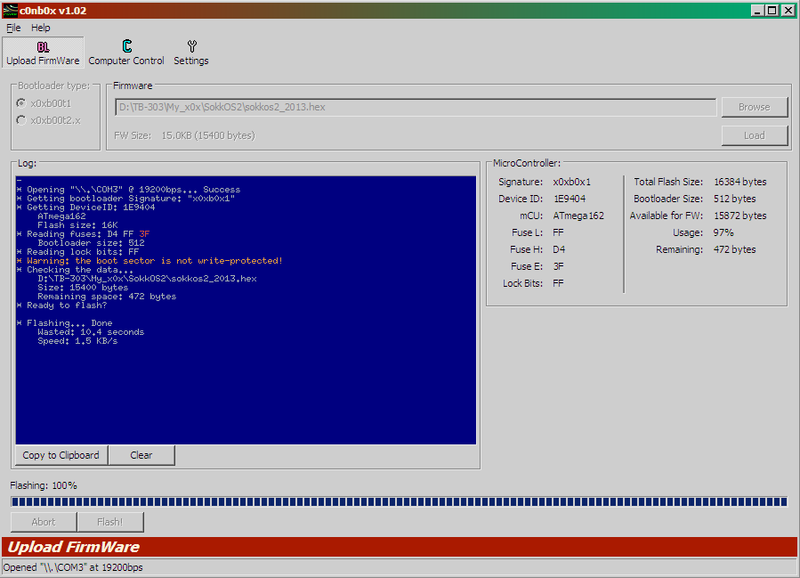 Power up the x0x, connect it to your computer by USB and see if there is a "USB Serial Port (COMx)" (x=2..99) device in device manager. (see: https://www.drivereasy.com/knowledge/a- ... n-windows/ ) You need this number for setting up c0nb0x! If you see this COMx port, than a)the FTDI chip inside your x0x works and b)your Windows has the proper drivers. If you don't see it, you have to solve that first. There is absolutely no use messing around with c0nb0x if you don't have that COM display in the device manager. Thanks for the help. I can confirm it seems like my bootloader is ok, I did the test starting in bootloader and then turn to other mode and it doesn't change. Thing is, I only have some Macs, no Windows. So I have tried Virtual Box/Windows XP and since I can make c0ntr0l talk with the x0xbox in the other modes I'm pretty sure the COM-port and driver things are working properly. USB almost always work extremely well with VirtualBox I use it a lot. I've also tried c0nb0x for MacOS with th X11 stuff but I can't manage to make it communicate properly although I managed to start the c0nb0x program and wander through it's options. But no proper contact with the machine. At least now I know the situation. Since I'm not planning to experiment with different OS I guess I might buy the latest non-experimental one on chip so I know what's inside my box. no, i wouldn't call sokkos 1.9.1 "latest" or even "stable"
I'm new here, and a perfect rookie regarding AVR programmation! To summarize: I built a x0xb0x last month (see https://plus.google.com/u/0/collection/U1pGLF, post of the 25th of June). The analogue part is ok, except low signal from the headphone amp. Maybe the amp op LA... is not a good part, I have to investigate but it is not serious. However: I have troubles with bootloading the ATmega162. I bought it blank in an elctronic components supplier, since there is apparently no more supplier of pre-burnt AVR for x0x. Thus, I tried via the UART plug/FTDI converter inside the x0x. I carried out the methodology as described in http://www.ladyada.net/wiki/x0x/bootloader, using CommAPi etc. Unfortunately, this method works with Windows x32 (more than 10 years ago?) and my PC OS is W7 x64. There are troubles with drivers while running CommAPI. Thus forget it, it appears to be "obsolete". I can specify that I soldered the FTDI microship, and the PC downloaded automatically the driver, attributing a new COM port. It is ok, but this bootloading route is not "direct". Thus, Forget methodologies above. Windows and programmers are apparently not the best friends in the World, due to hard communication. Thus I bought a programmer AVR ISP from DIamex (https://www.reichelt.com/de/en/Programm ... CLE=110344). I removed the ATmega from the socket, I placed it on a breadboard, and connected the 6 pins (Miso, Mosi, Reset, SCK V+5v and GND) to the right ATmega's pins (see image 2, https://plus.google.com/u/0/photos/1146 ... _urIrOHkdQ). I followed the procedure (required: WinAVR, Java, programmer's driver, Burn O Mat), without modifying the fuses, as in the tuto. My programmer's name is for B-O-M software "stk500v2". I did not try with "USB AVR", as I found in the long list. I obtained a reassuring message as in Image 1 (https://plus.google.com/u/0/photos/1146 ... _urIrOHkdQ, sorry for the poor quality). It was fine, I managed to flash the f* ATmega with x0xb0x-1_03.hex! Then I replaced it in the x0x... It's time to Switch on the bass synth! All leds are on, then off, except tempo which blinks very slowly. I can't modify the speed by turning the encoder. The bank encoder is ok: Led's sequencer are on one by one while I'm turning the "Bank" Grayhill. If I turned it too quickly in the same sense, Leds are not lighting in the same sense (i. e. the one before the one on while I'm turning quickly clockwise). Random mode produces notes, but the melody is always the same, whereas it is played very very slowly. I could check that the analogue section was okay! And other positions of the Grayhill selector could lit up some leds, but keyboard mode doesn't work. Half success, thus no success. Press any key to restart. I checked soldering quality, components orientation, I don't think problem is from the hardware. Something's wrong with the Bootloader. I tried c0ntr0l but the soft failed to connect to the x0x. I tried c0nb0x but It bugged... maybe the reason is: c0nb0x was designed for windows 32. I'm damned! x0x is an obsolete technology, 12 years after its birth??? Well, I'm waiting for yours kind "debugging" tips. In parallel, I am busy with another project: a 808-like modular (with external seq) DIY drum machine. I will show it soon! and generally, beware of new devices which ship the hardware immediately and promise great firmware/software features to come "very soon via updates"
Many thanks for your quick and very detailed answer. It will be very helpfull since I am not skilled regarding AVR prog. I have to follow your procedure, I imagine it was ever tested, right? Why did I choose a blank ATmega162? Because I did not find on the bay or elsewhere a pre-burnt Atmega or x0x. Willzyck stopped to ship this stuff, didn't he? Most of forums on the subject (how to bootload) are outdated, links are dead and people are trying with different programmers methods, more or (more likely) less with success. Maybe I flashed the old firmware 1_03.hex like a butcher (without Bootloader, I know it is not recommended for the PC to recognize the x0x connected via UART), but it works better now! With Burn O Mat, I removed the option "Divide internal clock by 8 ". I re-burnt the ATmega on beadboard. I put it in the x0x. The keyboard responds today! ANd the phone amp is fixed also. I have to read the manual to test sequencer... we will see. In fact I was considering setting the fuses with a blank AVR. But it may be lethal. I have a second blank ATmega to play with. Thus I will apply your protocole. I will give you news asap.